A veterinary assistant is a vital member of any veterinary team providing health care to animals in laboratories, animal hospitals and clinics. They work under the direct supervision of a licensed veterinarian or veterinary technician, performing routine but essential tasks on sick or injured animals, and helping manage pet owners’ questions and concerns. As veterinary assistants gain experience, they may take on more complicated tasks, such as administering medication, but essentially they perform the following duties to ensure a comfortable, safe and sanitary environment: feeding, exercising and grooming animals; cleaning and disinfecting cages and work areas; sterilising laboratory and surgical equipment; restraining and handling animals. Additionally, they could perform office tasks, such as scheduling appointments, checking in animals, documenting medical histories and ensuring the proper medical equipment is stocked, functioning and clean. Why did you choose this profession? Ever since I was young I have loved being with and working with animals, and I knew I needed something different to the usual office job. Every day at the veterinary practice brings its own excitement. What training did you undergo? I studied at Onderstepoort, Faculty of Veterinary Science. Is there a type of personality best suited to this work? Yes! Just because you work with animals does not mean you don’t need people skills. You must be a people person. Is experience as important as formal training? Yes. Over the years I have found that working at different organisations and working overseas has helped my career a lot. You do get better at your job and get to know what you are best at. Describe a typical day on the job The day usually starts off with drug orders – what was used the previous day and what will be needed. Then it’s admitting all the hospital procedures for the day and discussing with the owners what needs to be done, as well as confirming collection times. Next I have hospital discussions with the vet about all the cases in hospital and what needs to be done. Up until 2pm I am between the theatre and the kennels doing dentals, treatments, wounds, x-rays and the anaesthetics for the operations that are booked in for the vet. Finally, all the accounts need to be done and the medicines organised for when owners come to collect their pets. What do you like the most about your line of work? The fact that every day is different, with new cases in the hospital and exciting new things to do. Which aspects are you least keen on? Euthanasing animals is never an easy thing for me to do. A veterinary assistant is usually the entry-level position for anyone who would like to become a technician or veterinarian. A National Senior Certificate is usually a prerequisite for becoming a veterinary assistant. Some choose to become accredited through doing a course or diploma. Accreditation is not required, but employers generally prefer to hire veterinary assistants who have some background studies in animal science. 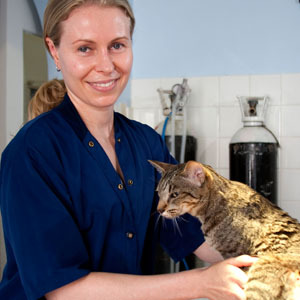 Many veterinary assistant programmes can be completed in less than a year. Students of veterinary science are required to register with the South African Veterinary Council.